I sometimes feel sorry for archaeologists. They can spend months digging for a couple of potsherds and a post hole, and then face the task of fitting this sparse and fragmentary evidence into some kind of pattern. I know that archaeology is about much more than digging. But even so, when it comes to material evidence, architectural historians have it better: enormous structures that can be read like books, even when there is no documentary evidence, for literal reading, to back up the stories told by the stones. But sometimes it's not so simple. Medieval buildings can be as complex and enigmatic as any excavation. And as for their decoration – battered by time, alteration, and iconoclasm, it can be as challenging to reconstruct as buried foundations or shattered pottery. Medieval stained glass is a case in point. So much of it has gone, thanks to neglect and decay and the activities of image-smashing vandals. In many churches, there are just a few fragments of ancient glazing, like this one in a window in the large and beautiful medieval church at Burford. So what can we make of this tantalising panel of medieval stained-glass bits and pieces? Staring at the central figure, I was struck by the hat. Wasn't that a pilgrim's hat? Yes, or more specifically, it's the hat of St James the Greater, with his cockle-shell badge, the disciple of Jesus who, having ended up in Spain made medieval Compostela the greatest place of pilgrimage after Rome itself. 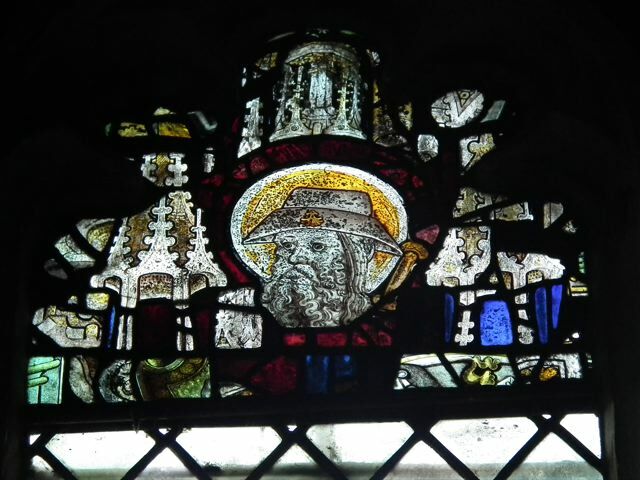 The bearded head of St James must have figured in many medieval windows, and here just his head has survived. Perhaps that's the top end of his staff, just to the right of his head. The folk had fallen in love with building, and loved that their goldsmiths' work, and ivories, their seals, and even the pierced patterns of their shoes should be like little buildings, little tabernacles, little 'Paul's windows'. 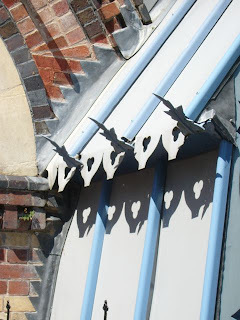 'Paul's windows' refers to the rose windows in Old St Paul's Cathedral, London, and the reference to the pierced patterns of shoes recalls a description of a snappy dresser in Chaucer's Miller's Tale, 'With Paule's windows carven on his shoes'. Reliquaries, boxes, furniture, yes, even shoes, were made to look like little buildings in the 15th century. And figures in churches, whether carved in three dimensions or painted in windows, were frequently set in a context of decorative architectural detail. How wonderful that some of this detail should have survived here, flanking the venerable, curly-bearded, beady-eyed face of St James, the saint who inspired men to go on pilgrimages. In five years of blogging I've visited and passed by many buildings, and shared a good number of them with my readers. But there are lots, including many that I visited in the distant past, of which I have no photographs in my digital archive to share with my readers. I do, however, have a small collection of old postcards of some of these buildings so, to vary further the architectural menu, I'm presenting some of these in an occasional series called Postcards from England. This is the first. 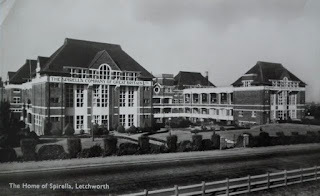 My postcard shows part of the Spirella corset factory, built among lawns and trees in the garden city of Letchworth between 1912 and 1920. The tall, hipped-roofed parts of the building shown in the picture reveal a strong Arts and Crafts influence in the design – white window frames and brick walls that would almost fit in in Bedford Park, and grids of square glass that seem to hint at more modern architecture. 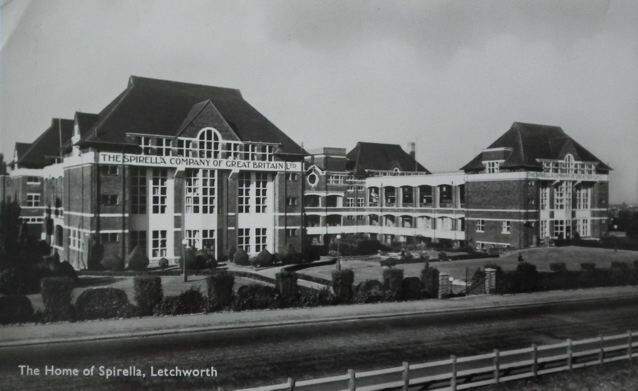 In fact the factory's architect, Cecil Hignett, who had earlier worked alongside garden-city planners Parker and Unwin, was at once sensitive to the Arts and Crafts heritage of Letchworth and alert to the possibilities of the new – behind the brick walls is a structure of reinforced concrete. Inside were light, airy workspaces in which Spirella's employees cut and sewed in comfort. William Wallace Kincaid, boss of the company, wanted to give his corsetières the best of working environments, because he was convinced that if they were happy they would also be efficient. "The Factory of Beauty", he called the building – implying both that it was a beautiful place and that his workers were producing garments that would enhance the beauty of their owners-to-be. Old-fashioned paternalistic values and an old-fashioned view of beauty, perhaps, but producing architecture that is worthy of more than a passing glance. Although the factory is no longer used for its intended purpose, the building has survived. Since a restoration in the 1990s it houses office space and public facilities such as a café and a gym. Whatever one's views of corsetry (and I know enough about my readers to realise that their views will be very diverse indeed), one can only be thankful that this wonderful building is still standing, and looking as beautiful as it did when the photograph in my postcard* was taken. *Don't forget that you can enlarge the picture by clicking on it. I first saw Rousham when I was a teenager, and I can remember being somehow surprised by the house. There seemed to be something hard and uncompromising about it, and I wasn't quite sure why I reacted in this way. Looking again at Rousham's 17th-century south front the other day, I think I was reacting not to the stone walls, the pale colour of which warms up beautifully in the sun, but to the windows. What I didn't know back then was that these were originally glazed with small octagonal panes, which were replaced with much larger sheets of plate glass during a 19th-century restoration project. 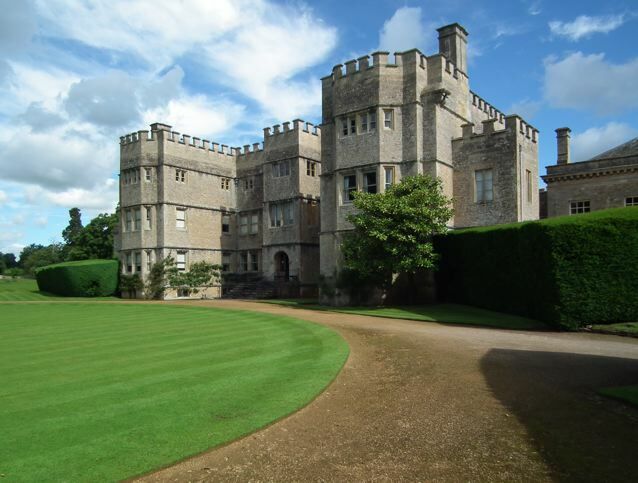 Rousham is a house dating from the 1630s and, apart from the plate-glass windows, one other alteration is visible in my photograph of the south front. About 100 years after the house was built, William Kent was employed to redesign the gardens. Kent also made some changes to the house, including adding the crenellations that top the walls – if you look closely at the picture you can see a slight change in the colour of the stonework towards the top. So today the front of the house reveals a 17th-century building that has changed with the times, and which still looks impressive in its green frame of trees. And at Rousham, the trees are very much the point. 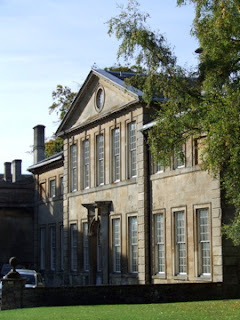 This place is rightly famous for William Kent's work in its garden, an arcadian landscape of conifers and hardwoods, paths and glades by the River Cherwell, punctuated by temples, a grotto, classical statues, cascades, and streams. I've posted about this remarkable garden before. It is one of the best places in Britain to go to savour the atmosphere and architecture of the Georgian landscape garden. 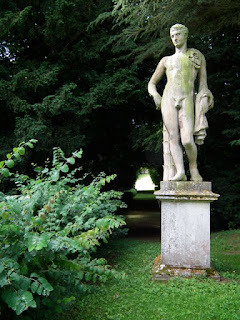 From the Venus Vale to the serpentine rill, from statues of Bacchus to the Dying Gaul, it is an enchanting garden, all set against a background of varied greens, displaying real a lightness of touch. Curving paths and distant vistas lead the visitor through a series of spaces, and often, as one contemplates a temple or a statue, there is the sudden realization that, in a gap between trees, another view is beckoning. In Arcadia indeed. Rousham: behind the statue a triangle of light leads the eye towards another glade. “Ah, I know what that will be,” I thought to myself, looking up above a shop called White Stuff in the main street in Bishop’s Stortford. I was thinking that the building must have been a pub called the White Hart – a common pub name after all – and that I was looking at its former sign. Big 3-D signs like this are uncommon, but they do exist, and I was pleased to find another. How wrong could I be? This magnificent beast is in fact the emblem of a volunteer regiment, the First Hertfordshire Light Horse. It was made in 1862 for the regiment’s barracks, but a few years later (some sources says in 1868, others 1872) the regiment disbanded. Major William Holland rescued the stag and had it mounted above the window of a shop he owned, where it stayed until the shop was pulled down in 1983. Then the hart was restored and installed on this shop in 1986, where it has been ever since. 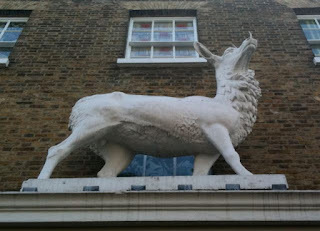 It’s seriously large, this stag – it towers over the adjacent sash window, which must be well over 4 feet tall – and its shaggy coat is vigorously rendered. It’s an asset to the streetscape, a reminder of a bit of 19th-century history, and an object lesson in the way some features survive, as if truly alive and kicking, against all the odds. 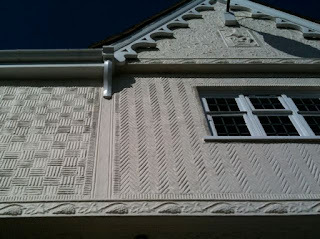 Pargetting, decoratively moulded exterior plasterwork, is a technique I associate with Suffolk, where plastered walls bear images of flowers, fruit, heraldry, and all kinds of abstract patterns. 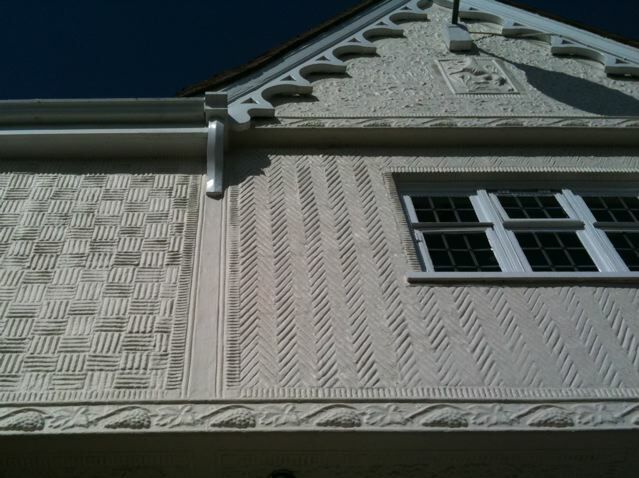 But decorative plasterwork is also found farther west, and here it is in Hertfordshire, adorning the front of the former White Horse pub in Bishop's Stortford, a building that’s now a restaurant. The White Horse was a pub for most of its life, closing in the 1930s, after which it was home to a succession of different shops. It has been a restaurant since the 1990s. The yard at the back, which housed the inn’s stables, has also been home to activities as diverse as a poultry market, a slaughterhouse, and a small brewery. So the building had a chequered history behind its bold and striking frontage. 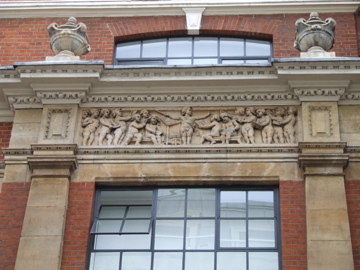 The plasterwork on the facade is modern (I’ve seen early-20th century photographs of the building with plain plaster) and conceals a timber frame that dates back to the 16th century. The design is quite simple – mostly abstract patterns set off by bands of bunches of grapes – but it makes the building stand out and was catching the sun beautifully on the day I passed by. Postscript 2012 This small paragraph contains a large truth: that the survival of historic buildings often depends on finding new uses for old structures. Even a highly specialized building like the roundhouse has lasted more than 200 years because people have found different things to do in it and with it. Sometimes a change of use requires some adaptation of the building, but a little sensitive alteration is better in the vast majority of cases than demolition or dereliction. Let’s hear it for thoughtful adaptation and sensitive reuse. Another celebratory 5th-anniversary reposting, this time of a favourite landmark in a small Northamptonshire town. Aynhoe Park is a striking country house in Northamptonshire, constructed in golden stone for several generations of the Cartwright family, who lived here from 1615 until the mid-1950s. This picture shows just one wing of the building. The house evolved over the decades between the 17th and early-19th centuries, and includes work by two great architects, the baroque master Thomas Archer and the Regency genius John Soane. Capability Brown landscaped the grounds. In a way though, this illustrious pedigree doesn’t matter very much. What matters most about this house is its location. It’s a country house in the middle of a village, one that stands on its head the convention of the upper classes isolating themselves in large parks and sweeping away their tenants’ cottages when they spoil the view. So when you approach Aynho from Banbury, the road bends dramatically to the left – and there’s the house, one the best surprises English architecture has to offer. Actually, the cottages of the village don’t spoil the view either. Aynho is one of Northamptonshire’s most beautiful places. Naturally, the houses are all built of local limestone. Naturally, lots of them have espaliered apricot bushes growing up the walls. A delicious place, if ever there was one. Postscript 2012 I like this post because it exemplifies a way in which I often respond to buildings – in terms of their context and setting. The architecture of this building is fascinating and beautiful, but the bend in the road, the surrounding houses, the intimacy of the great house and the small town, is what makes the place. 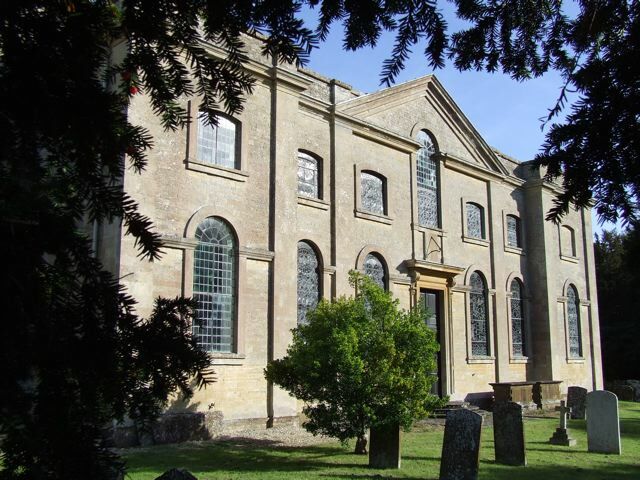 The nearby church, designed in the 1720s in an almost domestic style by local carpenter Edward Wing, was obviously meant to complement the house too, so forms another key part of the context. 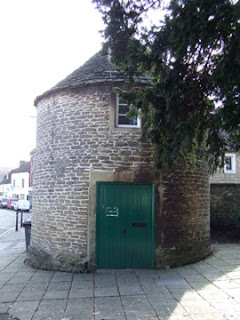 Here is a photograph of this unusual building. Here is a further re-posting, part of my series to mark this blog’s fifth birthday. Perhaps my readers will forgive my for including another one relating to printing and publishing – after all, such businesses have been central to my life for a long time. Postscript 2012 Novello’s (now part of the Music Sales group) is a 200-year-old company that found success in the Victorian period by selling affordable editions of music, championing British music, and selling scores of work by European composers from Berlioz to Wagner. 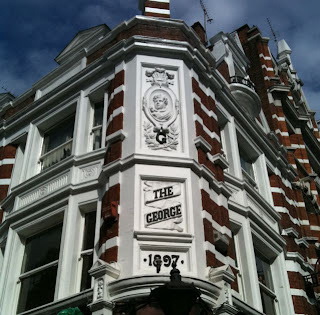 Although I’m no musician, I’d long been aware of their publications, but first noticed their building when drinking in the George, the pub opposite in Wardour Street, one evening. To commemorate this I add a photograph of the pub, with its plaster relief of the Prince of Wales and its stripy walls and elaborate window bays – very much in the late-19th century fashion and no doubt influenced by buildings designed by Norman Shaw and Ernest George. Here’s to it. Here's a second re-posting, another early piece from 2007, to celebrate the fifth birthday of this blog. I've included a second photograph, so that you can see some of the tiled decoration on the building more clearly (clicking on the pictures opens a new box in which they display larger, by the way). Bristol is rich in interesting buildings, in spite of the fact that swathes of the city were bombed during World War II. Some of the survivors, like the cathedral and the vast church of St Mary Redcliffe, are justly famous. This is one of the less well known. 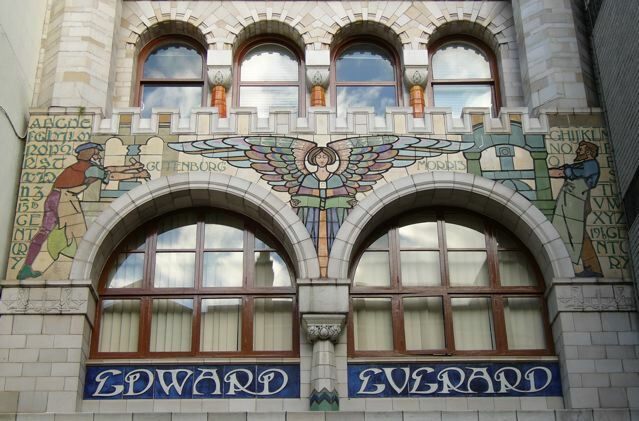 It’s the former printing works of Edward Everard in Broad Street. The interiors have been changed out of recognition, but the wonderful street frontage, covered in Carrara-ware tiles produced by Doulton and Company, survives and gleams. Gutenberg and William Morris, both working at their presses, stand on either side, looking inwards towards an angelic Spirit of Literature. 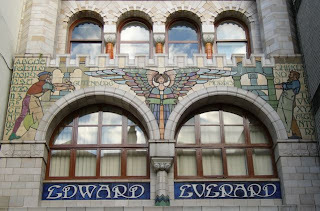 Below, the company’s name is spelled out in letters designed by Everard himself, while above, a figure representing Light and Truth looks down. W J Neatby, senior designer at Doulton’s, was the creator of these stunning tiles, and the whole composition, from the heart-motifs on the turrets to Everard’s swirling letter forms, conjures up what was most fashionable in English design around 1900. It’s rather like the early volumes in Dent’s Everyman’s Library, with their Art Nouveau bindings and title pages – a delight to the eye promising a feast for the mind. Neatby has become a hero of this blog, and I’ve also admired his work in London, Norwich and Leicester. 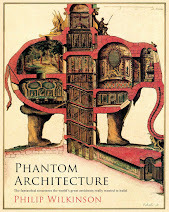 He worked at a time when Art Nouveau was wrapping its sinuous tendrils around everything from vases to furniture, and when architects weren’t ashamed to apply decoration to buildings and to use colour in profusion. When World War I finally ended in 1918, there no longer seemed to be a place for such exuberance. Architects looked to styles such as revived classicism or pared-down neo-Georgian – or espoused the caused of modernism and turned their back on ornament. I’m pleased that some of Neatby’s work has survived to remind of us of what came before. This posting of Neatby's elegant evocation of the history of printing is especially for Emma Bradford, designer of beautiful books and creator of lovely paintings and prints. 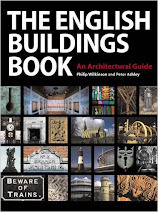 To celebrate the fifth birthday of the English Buildings blog, here’s a reprise of the very first post I did in July 2007, with a short postscript and an extra picture. You’d have to go a long way to find anything like this, the Spa Buildings in the middle of the small Worcestershire town of Tenbury Wells, which became a spa when saline springs were discovered in 1839. The 1862 design, by James Cranston of Birmingham, isn’t much like any other building – it’s a mixture of false-half-timber and greenhouse, with a bit of Victorian brickwork thrown in, all making a bizarre cocktail that contemporaries called "Chinese Gothic". The big clue is in the word "greenhouse". Cranston had been working on some glasshouses and got the idea of adapting greenhouse structure to a building for people. Out went the glass panes and in came steel roofing sheets and wall panels, to make one of the world’s first prefabricated buildings. The system was flexible enough to produce a pair of halls, a bath complex, and an octagonal tower to house the well with its pumps, which dispensed 20 gallons of mineral water per hour. Like later prefabs, the Tenbury Spa Buildings were probably not intended to last that long. And they certainly never caught the admiration of the architectural powers-that-be. 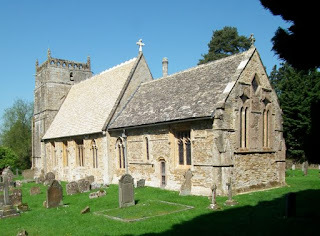 Nikolaus Pevsner, in the Worcestershire volume of his Buildings of England series, described them as "much like Gothicky or Chinesey fair stuff, i.e. without seriousness or taste". The people of Tenbury thought better of their unusual spa, though, and restored it at the end of the 20th century. With galvanized roof panels and a strengthened structure, the building is now better than ever. Postscript 2012 I might have noted that James Lees-Milne, in his 1964 Shell Guide to Worcestershire, was more appreciative of these buildings than Pevsner, although he got the date wrong. He wrote: “The baths no longer function, but there are some engaging remains (c. 1911) in a rusty tin pagoda tower and adjacent structures of tin with multicoloured brick entrance, a sort of expensive prototype of the Nissen hut.” Also, soon after I wrote the original piece I got hold of Alan Brooks’s excellent 2007 revised edition of Pevsner’s Worcestershire. In it, Brooks quotes the original “Chinesey” description, but gives a fuller and more generous account of the restored buildings, no longer rusty. He also notes that the spa was aimed at “the middling and working classes, [providing] every convenience at the lowest possible price”. Like Alan Brooks, I commend the building to you all, of whatever class – working, middling, and the rest. Five years ago this week, on a sunny afternoon at around the time of Wimbledon, the English Buildings blog was born. 7 July 2007, the date of the first post, was also the second anniversary of a date that’s etched on my memory. On 6 July 2005 two friends and I went to the Picture of Britain exhibition at Tate Britain, and during this visit the gallery was evacuated as the result of a bomb scare, an event met with the usual national sang froid and the search for a cup of tea. Driving home later, listening to Radio 4, I heard the announcement that Britain would host the 2012 Olympic Games. No doubt I’d have forgotten all this, except for what happened the following morning: the real thing, in the shape of the 7 July tube and bus bombs, one of which killed a young and cherished colleague. I simply don’t know whether, at some unconscious level, this blog’s celebration of architectural character, of places, and of the people who have made our buildings is some kind of reaction to the destruction wrought by those bombs, a search for continuity in the face of eradication and extermination. 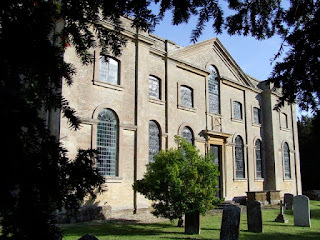 On a conscious level, I began the blog partly as a kind of informal follow-up to my English Buildings Book, partly as way of sharing some of the buildings I see on my travels, partly as a way of entertaining a few friends who like this kind of thing. I now have more than 250 followers and thousands of other readers, some who read the blog regularly, others who are looking for information on a specific building or subject. 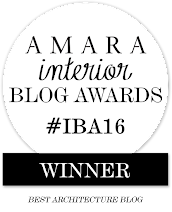 I thought when I started out that I’d be unlikely to keep the blog going for more than a year or two. But the positive responses of readers encourage me to carry on. Comments on the blog give me a channel of communication with my readers that I wouldn’t otherwise have as a writer of books. And the comments can be fascinating – updates on buildings from people who live nearby, nuggets of information about artists and architects, anecdotes that fill in the background to a particular building or place. For example, I’ve enjoyed learning, through comments and readers’ emails, about a building that formed part of the setting of a film, about the iconography of church carvings, about journeys among ruins, about details I missed and the changing fates of buildings in the weeks or years since I posted about them. So a big thank you to my readers, both the occasional visitors to the blog and the regulars, who truly represent continuity in the flux. To celebrate the fifth anniversary of the English Buildings blog, I’m going to reprise five early posts that most of my readers will not have seen (although all the posts from the blog are archived, and you can access any of them – nearly 500 altogether – via the “BLOG ARCHIVE” feature in the right-hand column). Rather than just repeating old posts, I’ll add a comment or two to the text, or sometimes include a new photograph of the building, so that anyone who did see the post first time around will find something slightly different.